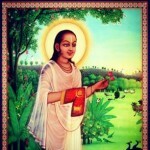 Sri Vallabhacharya was a great saint who propagated the path of devotion. His established the Pushti marg (path of grace). He has written commentaries on Bhagavatam, and many other works on Bhakti. 5. 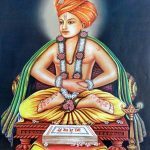 Name the father of Sri Vallabhacharya. 6. Who was Sri Vallabhacharya’s mother? 12. Name the devotee of Sri Vallabhacharya who led a dasi, Ranjani, to have the darshan of and merge with Lord Srinathji.